Click on graphic to read. 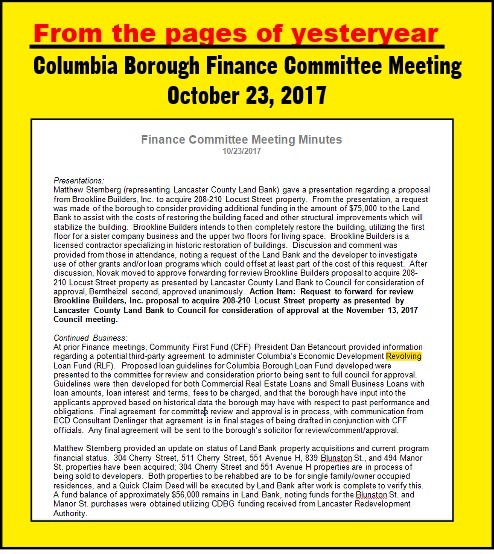 The trail of an ordinance | from inception to completed ordinance (Ordinance 897-2018, Borough of Columbia Commercial Revolving Loan Program Ordinance). This is another reason citizens need to have streaming and on-demand video. 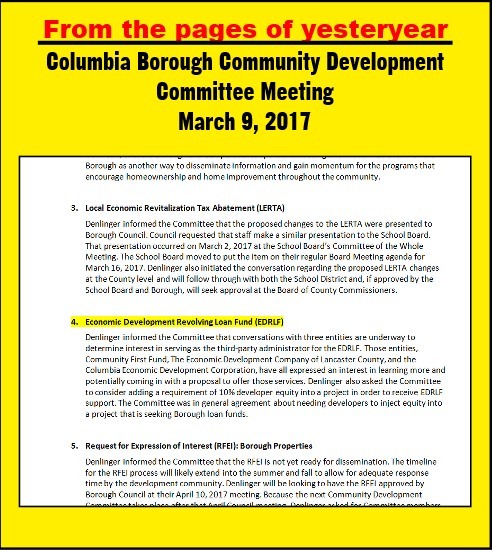 NOTE: There are no minutes for a Community Development meeting for 2/9/17 shown at the borough Website. The story on tax refunds well illustrates the vileness of the mainstream press. While stating clearly that most people will pay less taxes, the focus is on misleading information about refunds. The best tax strategy is to owe approximately twenty percent of the total on April fifteenth; this is an interest free loan to you from the government. A refund, conversely, is an interest free loan you make to the government. As /2 said over a hundred years ago, “figures lie and liars figure.” It’s no wonder the press is held in contempt. You may be correct, Mr. D.
However, there’s just been too much anecdotal conversations with other and, granted, media stories that indicate that the new tax law ain’t what it was billed. We’re holding judgment until we file our own. Then there’ll be one more anecdotal view. We’ve always favored and tried to attain the “no harm / no foul” stance and break even on April 15. 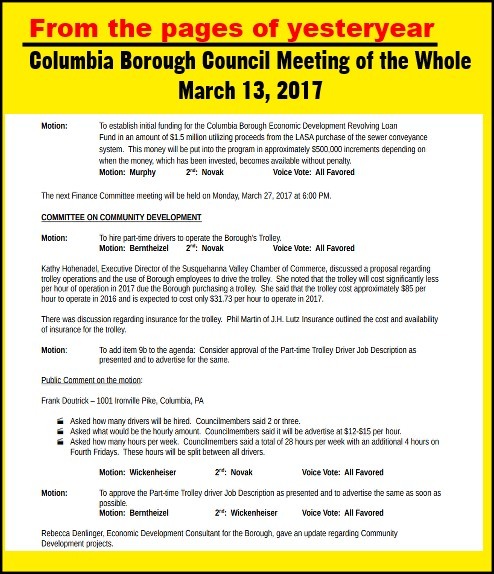 I have a question about the minutes from the March 13, 2017 council meeting. 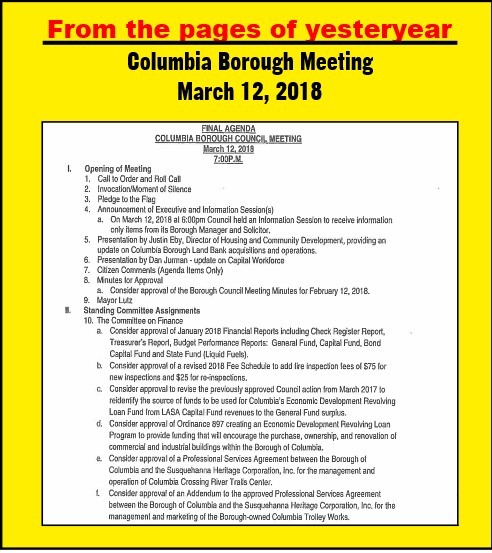 Since when does the council president make motions? Is that following Robert’s Rules of Order? A most troubling sentence comes out of the February 27th 2017 minutes. Where it was suggested that it may be necessary to loan money BEFORE the details of the Revolving Loan Fund were even worked out. Then the motion was made to move money into the general fund to the tune of $400,000 to support potential loans. 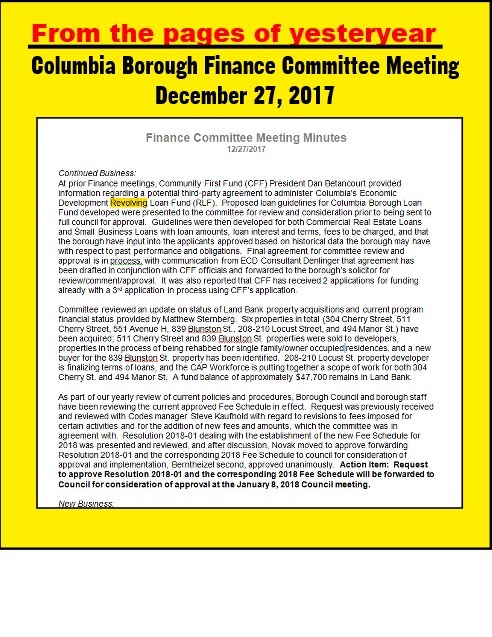 This is really problematic seeing that the loan fund was not even set up at that time and council is preparing to make loans. I would agree, that is most troubling! I’m also amazed at the lack of parameters. Leads one to believe it’s evidence of doing the loan backwards. Meaning, “this person needs money they can’t get elsewhere, so how can we give it to him?” Hence the creation of the fund. 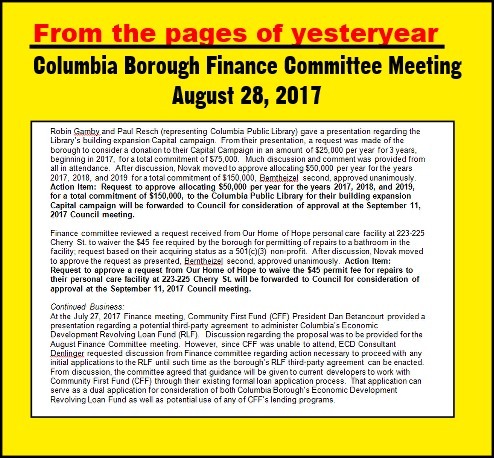 Who on Council in 2017 had the qualifications to approve a loan of that amount using taxpayer dollars from the general fund? 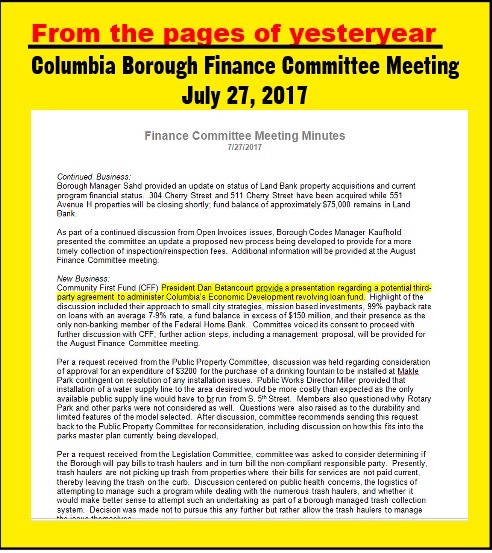 Was there a banker or a loan officer on council? 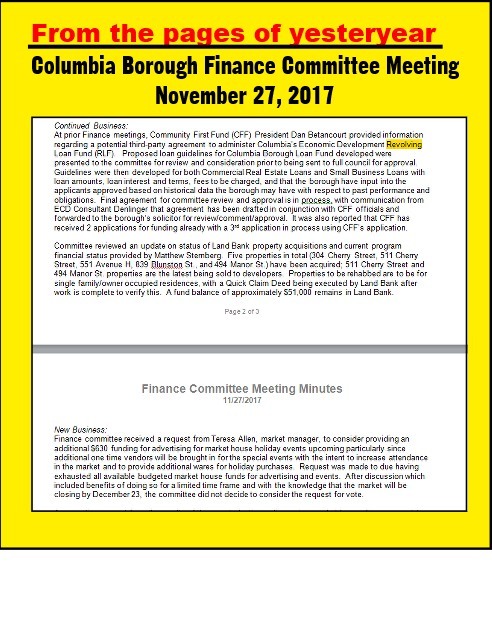 Another suspicious statement in the minutes of that meeting, how did Council know there might be a need for a loan prior to finalizing the Revolving Loan Fund? 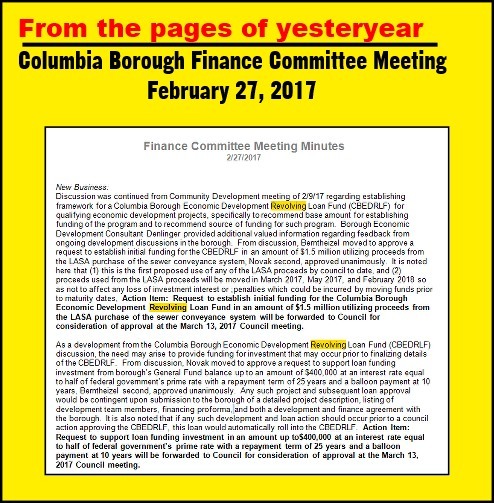 It appears that someone needed financing for a specific project and was looking to the borough as their source for those funds. It also would seem that the need was immediately if not sooner.